Who says a pot of risotto needs constant stirring? This creamy,flavorful version practically cooks itself. I love risotto and when done right, it’s primo. However, I just don’t have time to stir and stir and stir to reach that creamy consistency. In traditional risotto recipes, stirring loosens the starch molecules from the outside of the rice grains into the surrounding liquid, creating a smooth creamy-textured liquid. Yes, it works, I just don’t have time!! 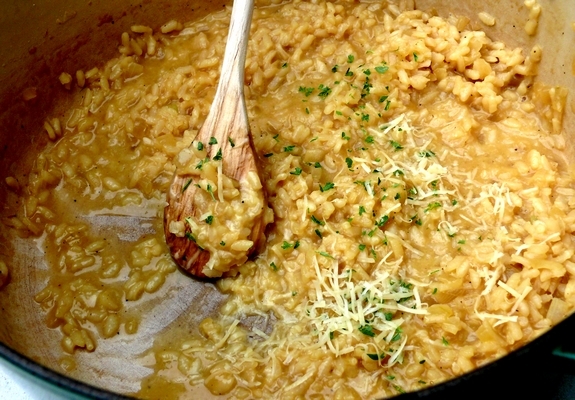 So, in comes this recipe that produces a creamy, yummy risotto with only a few stirs. I love it. You have to use arborio rice as it has the ability to absorb liquids and to release starch, making it stickier than long grain varieties. This recipe has made risotto a weeknight option and I am forever grateful. It is so easy!! Melt two Tablespoons of the butter in a large skillet over medium heat. Add the onion, 1/2 teaspoon Kosher salt and 1/4 teaspoon black pepper, and cook, stirring occasionally, until softened, about 6-8 minutes. Add the rice and cook, stirring for 2 minutes. Add the wine and simmer until absorbed. Stir in the Parmesan and the remaining Tablespoon of butter. Sprinkle with the parsley and additional Parmesan. Okay this is fabulous. I always shy away from risotto because who can stand there!! Am trying this tomorrow! Risotto that does not have to be watched so carefully. I am trying this. By the way DM me how you can post so much!!! I want to know the secret. Really! I love risotto, but haven’t tried it at home because it always seems so time consuming. This version looks like it’s right up my alley! What a perfect dinner idea and even better because it’s quick and easy. Not to mention, it looks so good. I like the idea of a risotto that practically cooks itself. I’m definitely of the James Bond school of risotto “Shaken, not Stirred”… a lot less work for sure. Also, I learned one of the secrets to Gordon Ramesey’s risotto (from Hell’s Kitchen) is to par boil the rice for 8 minutes before cooking it in the more traditional stirring fashion. Seems (surprisingly, coming from HK) much easier. I have never had risotto…think I need to try it. I must say I am skeptical. If you can make good risotto w/o the constant attention, why is this just coming out now? What is different about this method? YUM! I’m like you – I absolutely love risotto, and could easily eat it every day (I’m definitely a rice person, it’s my starch of choice), but it takes too dang long! It’s a special treat at our house, but I might just have to try this – it looks amazing! I cook risotto the old fashioned way. But if I cooked it this way, I probably could not tell the difference, and that would give me more time to be on my computer! Thanks for the timesaver tip! I will definitely give it a try. I usually cook risotto the old fashioned way. But I think I will try this way and maybe it will give me more time to be on my computer! Thanks for the timesaving tip. Hooray! Another person who just can’t do the “stand around and stir forever” routine! Thank you! Great tip Cathy, looks delish! My MIL taught me how to make risotto – and knowing my strong aversion to onions, subbed in diced apples and it was delicious! I use arborio too! and I too hate the stirring. Yum, I love risotto with white wine. Julia, the parboiling method is used by every restaurant I’ve ever encountered. Best way to do it is to parboil in stock and then reserve the starchy stock to use when you come to finish it off. I’m a big fan of the traditional stirring method which is why I never order risotto when eating out – I can always make a better one at home!